I’ve been working on a novel for what seems too long now, but in my defense time hasn’t always been on my side. 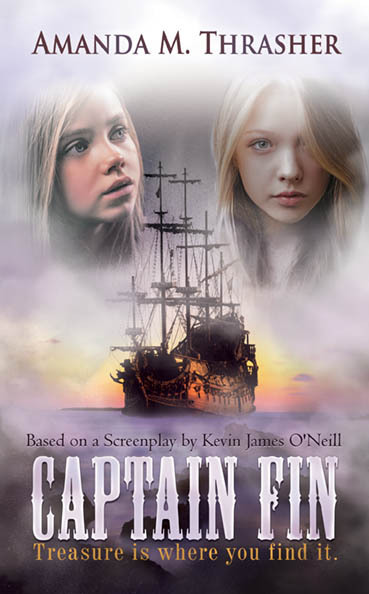 The story CAPTAIN FIN is based on a screenplay written by the talented actor, writer, movie producer, and director, Kevin James O’Neill. When Kevin approached me about writing this novel and I read the script, I can’t begin to tell you how excited I was, thrilled doesn’t cover the joy that I felt. I immediately fell in love with one of the characters, Hannah. Oddly it wasn’t at all from an angle or perspective that was presented in the script that he had handed me. But I could envision so clearly the direction that I felt he wanted to go; thus the reason he sought out a writer like me, a children’s author. I was so worried about my time commitments. Already in the midst of writing BITTER BETRAYAL and working every day at a company that I am a partner, owner, and as the CEO am obligated to be committed to running every single day. At one point I even told him, “Kevin, as saddened as I am, I don’t believe I have the time to finish Captain Fin. I love this piece, and if you want to take my ideas, chapters, and give them to another writer, I completely understand.” To my surprise, Kevin did not accept my offer but gave me a call instead. His words not only humbled me, but I felt as if he handed me a gift instead. I don’t think I will ever forget his words. I was worried that the flow of the work would be jeopardized by the amount of time that it was taking me to write the story, again, time wasn’t on my side due to work and family commitments. But I recently went back and reread my early chapters as I’m polishing off the manuscript before sending it to my editor. I must say, I was pleasantly surprised. I fell in love with Hannah all over again!!!! Her spirit, strong will, the sadness that reflects through her eyes, and the way that she eventually withdraws from others due to the hand that life has dealt her with her gentle spirit still intact, kills me! LOVE HER!